Thursday 29th October 2015 Our very first County Shield match was played at home to Newquay. We were outgraded on 4 of the 5 boards but put up a good fight going down 1½-3½. Well done to David R.Jenkins for recording our first win in this competition and to John for hanging on for a draw. Thursday 15th October 2015 GM John Nunn played a simul against 8 club members scoring 7½/8, Simon Bartlett being the only player who managed to take his illustrious opponent into a totally drawn endgame. Please keep that form up for the rest of the season! Wednesday 14th October 2015 Roberts Cup Lerryn 1-3 Bude. Congratulations to David Owen who made his debut for Bude on board 4. His win was the first result of the evening and took the pressure off the rest of the team. Chris was next to finish drawing a game she probably should have won. Ian took a draw on top board leaving John to win in a time scramble on board 2, a game that was technically lost after only 17 moves! That's the beauty of chess at this level, anything can happen. After 2 matches we are top of the Eastern Division. Saturday 3rd October 2015 The Peter Clarke Memorial Tournament was won by Stephen Piper of Salisbury with 5½/6, second was Philip Wood 4½/6. Thursday 24th September 2015 Liskeard B failed to show for our first match of the season so we are claiming a 4-0 win by default. Our team was Geoff, Ian, Chris & Dan. Thanks to them all for turning up on time. Wednesday15th July 2015 Bude chess are pleased to announce a fun Handicap Rapidplay 5 round Swiss Tournament in aid of The Friends of Bude Seapool. 19:30 to 22:00 GM Dr John Nunn is on holiday in the area and has kindly agreed to come along and play so a great opportunity to take on a GM with a lot more time on your clock! 18th May 2015 Bude were outgraded on every board against Camborne and lost ½-3½, Ian Rescorla being the one to earn a respectable draw. 25th April 2015 It is now confirmed that the Roberts Cup Final against Camborne"A" will be played at Liskeard on Monday 18th May 2015 at 19:30. 2nd April 2015 Roberts Cup Bude 2½-1½ Lerryn Full score here. Bude are the winners of the East division and now have to play Camborne"A" (winners West division)in the final. 25th March 2015 The Lerryn match has been rearranged for Thursday 2nd April 2015. 19th March 2015 Lerryn have requested a postponement of tonights match due to illness. We will meet as normal. 5th March 2015 Please note, some members still have a few games to play and that we are running out of time to get them completed. 22nd January 2015 We were privileged to have GM Dr John Nunn at our meeting this evening. He played Theo four times and the rest of us twice each at 5 minute blitz and won the lot although Theo played really well in his first game. Here are some photos of the evenng. 18th December 2014 The Christmas fun evening was a 3 round pairs competition with 20 minutes on the clock for each team. Players made alternate moves without conferring. Simon/Dan 0-1 Geoff/Chris; Theo/John 1-0 Simon/Dan; Geoff/Chris 0-1 Theo/John. The winning pair of Theo & John went home with a chocolate orange each. All the players enjoyed crisps,mince pies, chocolates and tea/coffeethroughout the evening. 11th December 2014 Next Thursday will be a fun evening. Exact format to be decided on the night! 14th November 2014 The 2nd Bude Rapidplay Congress will take place on 25th April 2015. Click here for entry form. 6th November 2014 It has been announced that our Roger Grime KO Cup semi final away to Newquay will be on Monday 1st December. 16th October 2014 Lerryn are back in the league. Fixtures are now in the diary. 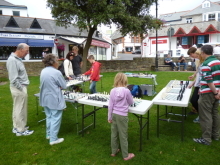 From the re-start in September Bude Chess will be meeting weekly. Bude Chess are pleased to announce that they will be entering a team into Division 2 (East) of the Cornwall Chess League for season 2014-15. The 2013-14 championship has been won by Theo Slade 12.5, with Simon Bartlett second, 11.5, and Geoff Lingard third, 7. The return match was played at Lerryn on 3rd April, The Bude team of Theo Slade, John Constable, Chris Constable, Phil Newberry and Dan Sanders winning 8.5-1.5 to win 15-5 on aggregate. 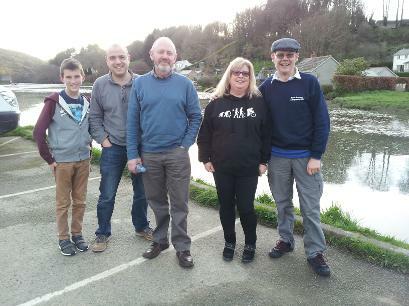 Bude Chess Club played their first inter-club match on Thursday 13 March 2014. The team of 5 consisted of Geoff Lingard, Keith Jones, Phil Newberry, Chris Constable and Dan Sanders. Players played 2 games against their opponent, one as black and one as white, with each game lasting up to 90 minutes. At the half way stage scores were even with each team having won 2 games and drawn 1. However, during the second half of the evening Bude Chess played carefully and won the match 6.5 to 3.5. Individual scores on results page. 13th March 2014 sees Bude Chess play its very first match, a five board friendly at home to Lerryn. The format will be the same as the Cornwall 500 league i.e. each player plays 2 45 minute rapidplay games, 1 white, 1 black. The return match will be played at Lerryn on 3rd April. We regret to announce that Peter Fitzpatrick passed away suddenly on 22nd February 2014. He only came along to the club about three times but was very enthusiastic and looking forward to playing in our first match against Lerryn. Our sympathies go to his family. 2014 starts on 16th January. We start our second season on 12th September. New members very welcome. 17th January - We welcome Alan Zofferty to the fold and hope that he enjoys his chess with us. It was good to see Geoff back again this evening after a seriuos illness. The spring session will commence on 17th January 2013. We are pleased to announce that Geoff Lingard is much better and is looking forward to seeing us again on the 17th. The first Bude Chess Tournament has been won by 12 year old Theo Slade with 6/6. Theo Slade 6, Simon Bartlett 5, John Constable 4, Chris Constable 3, Peter Gill 2, Dave Carter 1, Andrew Slade 0. 22nd November 2012 Geoff is making a slow recovery but has unfortunately had to withdraw from the current tournament. We hope to see him back in the new year. 7th November 2012. Geoff Lingard is recovering from a serious illness. He is still in Barnstaple hospital but hopes to return to the chess club on 22nd November. 15th October 2012. John Constable represented Bude Chess at the Dorset Chess Congress in Bournemouth this weekend. It was his first congress for 13 months and in spite of being a bit rusty reached 3.5/4 in the Minor section before blundering a won position on top board in the last round to finish 4th equal with 3.5/5, winning a share of the grading prize. 11th October 2012. We are all sorry to hear that Geoff Lingard is in hospital and everyone at Bude Chess wishes him a speedy recovery. The first meeting of Bude Bishops took place on Thursday 27th September 2012. Eight players turned up so it was decided to add another evening on 13th December so that an all play all tournament could take place. Fixtures can be found here and results here. On Sunday afternoon 9th September, Theo Slade 11, from Marhamchurch, the current West of England and Cornish under 12 chess champion, took on all comers in the Triangle in Bude to publicise the start of a new chess club in Bude. Theo played 20 games and at one point was playing 6 at the same time. He ended up winning 18, drawing one, and only lost once. Our thanks go to Theo for this effort. The picture shows Theo (red top) making a move whilst the other players await their turn with John (striped shirt) on hand to answer any questions and ensure that no cheating went on!